A culvert is a pipe that carries water under or through some feature (usually a road or highway) that would otherwise block the flow of water. The culvert acts as an open channel as long as the flow is partly full. The characteristics of the flow are very complicated because the flow is controlled by many variables, including the inlet geometry, slope, size, roughness, approach and tailwater conditions, etc. Therefore, an adequate determination of the flow through a culvert is generally made by laboratory or field investigation. Culverts are classified according to which of their ends controls the discharge capacity: inlet control or outlet control. If water can flow through and out of the culvert faster than it can enter, the culvert is under inlet control. If water can flow into the culvert faster than it can flow through and out, the culvert is under outlet control. Culverts under inlet control will always flow partially full. Culverts under outlet control can flow either partially full or full. H2OCalc analyzes culverts using two different approaches: a simplified culvert analysis method and the Federal Highway Administration’s (FHWA) HDS No. 5 method (Normann et al, 1985). Both techniques are described below. The simplified method classifies culvert flow into six different types on the basis of the type of control, the steepness of the barrel, the relative tailwater and headwater heights, and in some cases, the relationship between critical depth and culvert size. These parameters are quantified through the use of the ratios in Table 3.4. The six types are illustrated in the following figure. where ke is the local loss for entrance. Water passes through the critical depth near the culvert entrance, and the culvert flows partially full. The slope of the culvert barrel is greater than the critical slope, and the tailwater elevation is less than the elevation of the water surface at the control section. As in Type-1 flow, flow passes through the critical depth at the culvert outlet, and the barrel flows partially full. The slope of the culvert is less than critical, and the tailwater elevation does not exceed the elevation of the water surface at the control section. When backwater is the controlling factor in culvert flow, the critical depth cannot occur. The upstream water surface elevation for a given discharge is a function of the height of the tailwater. For Type-3 flow, flow is subcritical for the entire length of the culvert, with the flow being partial. The outlet is not submerged, but the tailwater elevation does exceed the elevation of critical depth at the terminal section. where A3 is the flow area at section 3 (i.e., the exit). As in Type-3 flow, the backwater elevation is the controlling factor in this case. Critical depth cannot occur, and the upstream water surface elevation for a given discharge is a function of the tailwater elevation. Discharge is independent of barrel slope. The culvert is submerged at both the headwater and the tailwater. where Ao is the culvert area. The complicated term in the denominator corrects for friction. For rough estimates and for culverts less than 50 ft long, the friction loss can be ignored. Partially full flow under a high head is classified as Type-5 flow. The flow pattern is similar to the flow downstream from a sluice gate, with rapid flow near the entrance. Usually, Type-5 flow requires a relatively square entrance that causes contraction of the flow area to less than the culvert area. In addition, the barrel length, roughness, and bed slope must be sufficient to keep the velocity high throughout the culvert. Type-6 flow, like Type-5 flow, is considered a high-head flow. The culvert is full under pressure with free outfall. Note that distance h3is undefined. For conservative first approximations, h3 can be taken as the barrel diameter. The Federal Highway Administration (FHWA) offers equations as well as nomographs that can be used for analysis and design of culverts. Different equations and nomographs are developed for inlet controlled culvert flows and outlet controlled culvert flows. Only equation based analysis and design approaches are described in this section. Readers interested in the FHWA nomographs, for both control types, may refer to Normann et al. (1985). Culvert design according to FHWA involves analyzing the culvert under both inlet control and outlet control conditions and selecting the control type that yields the worst condition (i.e., larger headwater depth). The design would be acceptable if the governing headwater depth is less than the maximum allowable headwater to avoid flooding of streets and property. Otherwise, the design needs to be revised (e.g., culvert size is increased) to reduce the headwater depth. The objective is to determine the headwater depth based on predetermined design discharge and a trial culvert size. 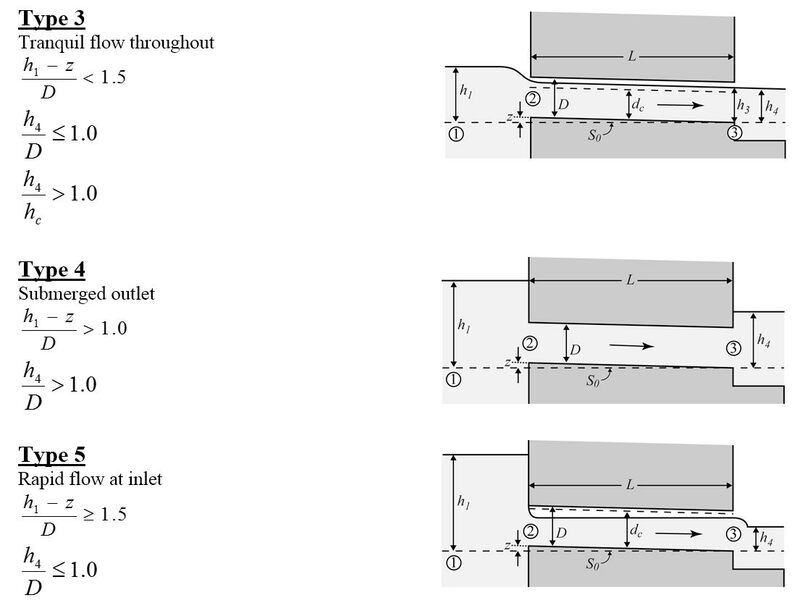 The design equation used to determine headwater depth for inlet controlled culvert vary depending on the flow condition at the inlet of the culvert. If the inlet is submerged, the flow type would be orifice flow. Unsubmerged conditions will behave as a weir flow. Z = culver barrel slope term (ft/ft). 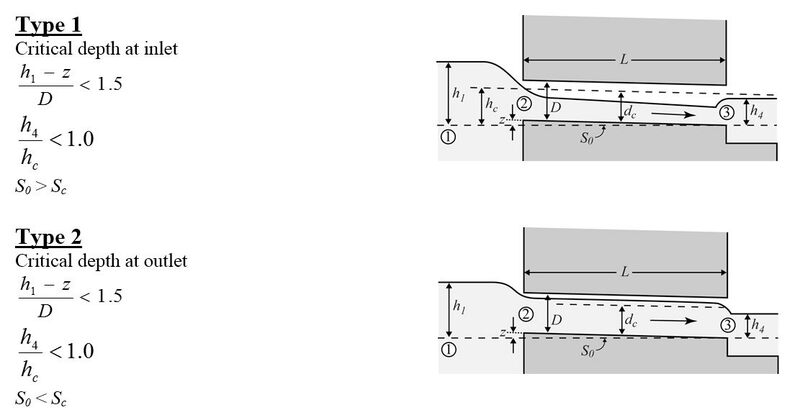 Headwater for outlet control conditions can be determined using energy equation based on tailwater depth and head loss through the culvert considering entrance loss, exit loss, and friction loss.